Song of Solomon takes its title from the first verse of the book, which mentions who the song comes from: “The Song of Songs, which is Solomon's” (Song of Solomon 1:1). The original Hebrew version of the book took its title from the book's first two words, shiyr hashiyrim, usually translated as “the song of songs.” This latter title remained in Greek and Latin Bible translations in later centuries. The repetition of the word song indicates that the writer considered this “the greatest of all songs.”1 We find a similar construction in other famous biblical phrases: Lord of Lords, King of Kings, and Holy of Holies, to name a few. The title of the book eventually took on King Solomon's name because of the mention of his name throughout the book (1:5; 3:7, 9, 11; 8:11–12). This title change also supports the traditional view of Solomon as the author of the book. While numerous critics in the last two centuries have disputed Solomon's authorship, the internal evidence seems to support it, not only because of the appearances of Solomon's name but because of evidence of his royal advantage (3:6–11) and his numerous wives and concubines (6:8). Solomon wrote the book during his reign as king of Israel, meaning he composed it sometime between 971 and 931 BC. Scholars who hold to Solomon's authorship tend to agree that the song was written early in his reign, not merely because of the youthful exuberance of the poetry but because his harem of 140 women, mentioned in 6:8, is relatively low in number compared to the final tally of 1,000 (1 Kings 11:3). Also, the author mentioned place names from both the north and the south of the country, including Lebanon and Egypt, reminding us of the relative peace and good relations among these nations early in Solomon's reign. This book remains singular within the Old Testament for at least two reasons: its character as a single poem and its subject matter, particularly the frank discussion of love between a married couple. The Song of Solomon's willingness to broach the topic of physical love within marriage has made many of its readers throughout history uncomfortable, so much so that Rabbi Aqiba had to vigorously defend the book's place in the Jewish canon even as late as AD 90 at the Council of Jamnia.2 But as a testament to the beauty of the marriage relationship in its fullness, Song of Solomon stands out with its uniquely detailed vision of this beautiful reality. The fullness of the union that takes place at marriage is described in some of the most splendid poetic language in the entire Bible. In a world where so many speak of God's special gifts with coldly clinical or apathetic statistical language, the passion of Solomon's poetry refreshes a world thirsty for the truth about marriage. Solomon began his rendering of this relationship with the two lovers in courtship longing for affection while expressing their love for one another (Song of Solomon 1:1–3:5). Eventually, they come together in marriage, the groom extolling his bride's beauty before they consummate their relationship (3:6–5:1). Finally, she struggles with the fear of separation, while he reassures his bride of his affections for her (5:2–8:14). All of this reinforces the theme of the goodness of marriage. Some suggest the book also pictures in a more general way Christ's love for His bride, the church. From courtship to marriage to the assurance of love, Song of Solomon poetically presents a broad range of events and feelings in the days leading up to and during marriage, offering encouragement toward an enduring love amid the petty jealousies and fears sure to threaten even the strongest of relationships. We should heed the Song's sublime words by continuing to value marriage as one of the bedrocks of society, appreciating the goodness and the beauty borne out of the union of two people in holy matrimony. Would you consider your marriage a sign of God's goodness and beauty working in your life, or has it become something less than that over time? Song of Solomon reminds us that both marriage and the physical union that follows originate in God; we should therefore consider each of them as evidence of His grace working itself out in the world. 1. Dennis F. Kinlaw, "Song of Songs," in The Expositor's Bible Commentary: Old Testament, abridged ed., ed. Kenneth L. Barker and John R. Kohlenberger III (Grand Rapids: Zondervan, 1994), 1027. 2. Tom Gledhill, The Message of the Song of Songs: The Lyrics of Love (Downers Grove, Ill.: InterVarsity, 1994), 35. 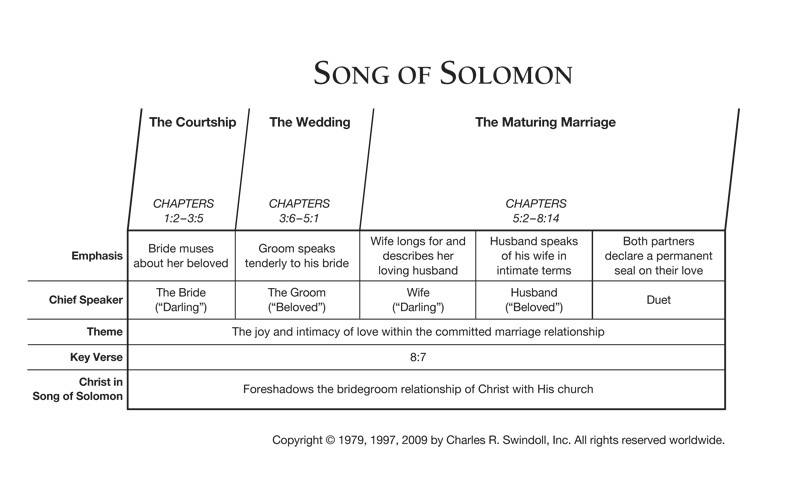 Find resources in the book of Song of Solomon in our resource library.